These new liner products from the HIP High Intensity Pigments line for L'Oreal have received tons of great buzz on The Makeup Alley, and although they are not gel or cream liners like the rest of the products in my liner review series, I thought I should test them out. A quick trip to Walgreens had me in front of the display, showing six shades on a special display unit, products hung on pegs from their cute loop-topped containers. There is no doubting the similarity in packaging and product to Guerlain's Kohls, which I have admired on the Guerlain displays but had never purchased. Even with a little personal instruction at Bergdorf one day with my buddy Kathy, having the SA show us that we should dab a liner brush on the wand inside instead of attempting to apply the loose powder liner with the wand itself, I feared fallout and did not want to contend with the mess. Kathy has mastered the Guerlains. I'm always in awe of her skills. But, MakeUpAlley claims of staying power had me hooked, so off of the hooks I selected the HIP Kohls in Black, Burgundy, Navy and Teal. The Burgundy was the most interesting of the shades, so this is the one I chose to test out. I thought I should give the applicator a chance, as well as using the Bergdorf-instructor separate brush technique. I unscrewed the cap of the HIP, and immediately little specks of product started to fall off of the wand. I was a bit disturbed by the chunky crumbs that were now lying on my vanity table, but I kept on. I used the wand to apply the loose liner powder to my upper lash line. Crumbs fell on my cheeks and lashes, crumbs were falling on my hand, crumbs were everywhere. But I persisted and got the liner on, a bit thicker than I would have wanted by using the enclosed wand, but it was very pretty and had a definite metallic look. I reached into my brush cup and pulled out a very very skinny old Sephora brand liner brush, and it fit down into the container well of the HIP. I pulled out the brush (more fallout) and tapped it a bit to try to get off some of the excess (more fallout) and used the brush to apply the liner to my lower lash line. Definitely using the Sephora brush was a better way of applying, because I was able to achieve a much thinner line. And then I did something very dangerous. I re-dipped the Sephora brush and applied the liner to my waterline, the inner rim of my eye, both upper and lower. I loved the smoldery look this gave my eye. Very sophisticated (definitely not my usual style) and almost smokey-eye looking (which I love on others but can rarely achieve on my own.) 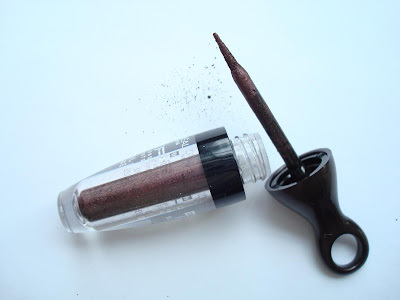 I wiped off all the fallout and crumbs off of my eye and cheek area, and was completely delighted with the eye look I had created with this Burgundy Kohl. As is the usual case, the raves on the MakeUpAlley with regards to staying power were completely true. The line on my upper lash line did not budge, it stayed clear and didn't crack or flake off or smear in the least. Same with the lower lash line. The waterline began to wear off within an hour or so, which is odd because it wore off unevenly. I don't have watery eyes or any allergy issues with my eyes, so I was surprised. But I still loved the way it looked on the lash line. About three hours later, getting ready to head out for the evening, I checked the liner. It was still absolutely perfect looking, beautiful, exactly as I had applied it, with the exception of the uneven waterline. But what did I see? A red bump? Right there on the lower lash line, a red bump. A stye. I couldn't remove the entire eye look fast enough. I grabbed the L'Oreal Skin Genesis wipes and gently began to remove all of the HIP kohl. It wouldn't budge. I ran for the Benefit Gee That Was Quick and a clean cotton ball. It took three attempts to remove all of the HIP. In terms of Line Up score, I am not sure how to rate this product. If I rate it only on appearance and staying power, it would recieve a perfect 10. It is that beautiful. The fallout and crumb issue would definitely drop the rating down to about a 3 because it is so messy and hard to apply. And with the stye issue now, I'd give the stuff a big fat zero. I haven't had a stye since I was in college, back in the 60s, when we dorm girls all shared our makeup without even thinking of cleanliness or bacteria. So I have to just attribute the stye to the HIP liner. Nothing else in my daily routine would have caused it. Good thing Walgreens has a fair return policy. I don't like the looks of that packaging. With the style of handle, etc., it looks like it would be very difficult to apply. There's sort of a disturbing Wet 'n Wild look about that product. Memories of earlier days with cheap makeup. Which may explain the stye. Sorry about your stye, Patti. I bought this in the Teal and I have to say that I love it. There is a lot of fallout from the applicator, so I hold a tissue under my eye as I apply the liner. But I love smudging the liner once it is a pplied and having a perfect dark green smokey eye in 30 seconds. Also, I have really sensitive skin and can't wear most mascaras because my eyes get red, burning, and irritated, and I have worn this liner for 4 full days with contacts without any reaction. I'm curious if any others have had styes or problems because at $13 a pop at Walgreen's, I don't know if I want to go back for other colors now even though I love the teal one I got. I have found that HIP eye products cause me to have an allergic reaction. when they first came out, I was all about trying them. But my eyes got puffy and weird. So I stopped. Tried again later hoping it had been a fluke, but nooooo.....I had never had an allergic reaction to eye makeup which is why I was thrown off, but I have accepted that for whatever reason, they are not for me. Styes do not develop that quickly. Something other than the HIP liner caused the stye. I also don't think it's fair to blame your stye on that liner. It takes much longer than that to develop a stye. A friend of mine is allergic to certain red dyes so she often gets reactions with burgundy and purples, maybe it's your case too. Review Laura Mercier's Bleu Marine. Only eyeliner I will ever, ever need!! 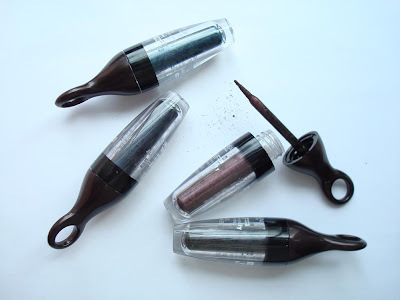 Really to repeat what the others say, your liner probably could not have created a stye that quickly and it would be very easy for some germs to get on one of your brushes without you knowing and create one. So it's not really fair to blame the liner. Also, I think the crumbles could be dealt with as you got more used to the product. Other lines have tried to copycat the Guerlain Kohls before and it never works. Physicians Formula even had the same bottle and applicator (since discontinued)--but the thing that just can't be duplicated is the extremely fine texture of the product. No clumps, no chunks, no styes, just gorgeousness. The application method for the wand-type liners like this is super-easy. Don't try to draw the powder on the waterline, just touch the wand horizontally to where you want the stuff to go. Then blink to help distribute it. First, it's true that you could not have developed a stye that quickly from the liner. However, you mentioned that your Sephora brush was "old." Did you give any thought to the bacteria that brush could be harboring? Katee: The packaging is odd, that's true! And it is difficult to master the application, but some blogdorf readers have posted that it takes a bit of trying to master it. Laura: There is no seal on the packaging, either, which might mean someone tested the one I purchased and perhaps it was contaminated already before I bought it. After I read your post, I am thinking this could be the reason for what happened to me after I used the product. Melanie: Thanks for the eye sympathy and the tips! Stay away from the burgundy! I bet the teal is gorgeous on you! Anon 1: I've read some reviews and comments on makeupalley that others have had irritation from some of the HIP eye products. I stand by my review. JThompson RN: I stand by my review. Kristy: I stand by my review. Strega: Thank you. It's definitely a possibility that it was the red coloring dyes in the burgundy that caused the problem. I didn't test the other colors. Anon 2: I'll definitely look for the Laura Mercier the next time I can get to a counter! Amanda: Of course I used a clean brush. I'm fastidious about my brushes and anything else that touches my face and eyes. I stand by my review. Apocalypstick: Physicians Formula did knock off lots of Guerlain packaging styles in their old Retro line! I remember those! Anon 3: "Old" does not mean "dirty" -- I stand by my review.